Robin Blaser, one of the key North American poets of the postwar period, emerged from the "Berkeley Renaissance" of the 1940s and 1950s as a central figure in that burgeoning literary scene. The Holy Forest, now spanning five decades, is Blaser's highly acclaimed lifelong serial poem. 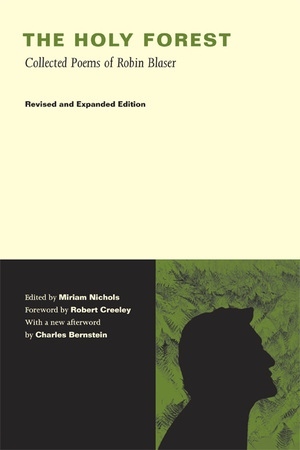 This long-awaited revised and expanded edition includes numerous published volumes of verse, the ongoing "Image-Nation" and "Truth Is Laughter" series, and new work from 1994 to 2004. Blaser's passion for world making draws inspiration from the major poets and philosophers of our time—from friends and peers such as Robert Duncan, Jack Spicer, Charles Olson, Charles Bernstein, and Steve McCaffery to virtual companions in thought such as Hannah Arendt, Maurice Merleau-Ponty, Michel Foucault, and Jacques Derrida, among others. This comprehensive compilation of Blaser's prophetic meditations on the histories, theories, emotions, experiments, and countermemories of the late twentieth century will stand as the definitive collection of his unique and luminous poetic oeuvre. Robin Blaser is Professor Emeritus at Simon Fraser University. Among his many books are The Fire: Collected Essays of Robin Blaser (UC Press), Pell Mell, and Syntax. Miriam Nichols is College Professor at University College of the Fraser Valley and editor of Even on Sunday: Essays, Readings, and Archival Materials on the Poetry and Poetics of Robin Blaser.